We can’t lie; when we heard the news that Soho House, a private members’ club that has grown into a mighty international brand, was to open a location in Brixton it seemed that it really was the end. The Soho House company is synonymous with member’s only exclusive locations, so it seemed that the social divide many had feared, had made its check mate move. However, when we actually went on a Friday night, we were pleasantly surprised. Located in the dark basement of Piano House on Brighton Terrace, which is usually a building filled with start-ups, charities and a medical centre (also happens to be our dentist). It fills a space where many clubs have come and gone – quiet ones that didn’t make enough money and more recently noisy ones, associated with some trouble on the street which were closed down. We visited early in the evening. A bouncer greets you at the door, pointing towards a pink lit stairway down to the basement of the building. A table football greets you, sure to keep those entertained while they wait for their table. We originally planned for just a drink, intending to move on to eat elsewhere, but two rounds of cocktails later and there was no chance we would be walking anywhere far. So we rolled into the restaurant. But first the Fox Bar, which is the cocktail bar part of the setup. This is relatively small, long and narrow with the bar at one end. There are comfy chairs and stools. It has the ambiance of a proper dive, with exposed brickwork, no windows and an arched ceiling. It isn’t massive, so get there early if like us you prefer to have a table. The cocktail list is short but you can order off the menu too, if you fancy the classics. We noticed that here, as in most similar places, the invented cocktails from their own list, are a lot sweeter than the classics. We don’t really like them too sweet, but the sensation seeker in our midst still chose to try the Banana Penicillin that is described as “a banana infused Bacardi Oro with ginger, honey, lemon and peat”. This was definitely a drink like dessert so beware. But they are just as happy to make the classics, if mad descriptions are not that tempting. 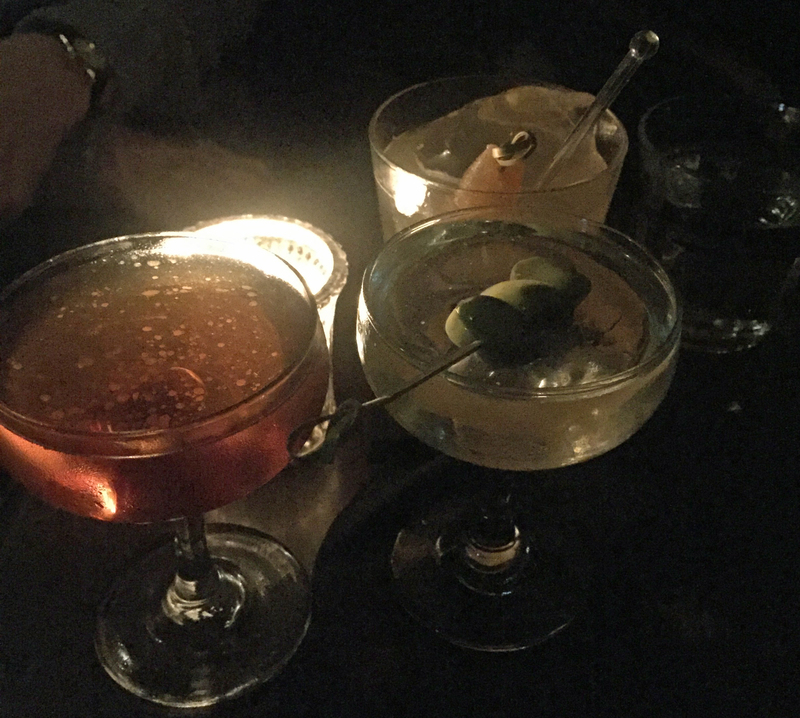 Our yardstick tends to be a dirty martini, as you might already have guessed, and given the repeat order you can take it that these met the mark. Although they have a small selection of bar snacks, it was clear we needed more, so moved into the adjoining larger restaurant for some much needed sustenance. We got there a bit after eight, when there was plenty of room, but were told it gets busier later on. The food here is the standard fare from both the Chicken Shop and Dirty Burger menus, which are also part of the Soho House empire. 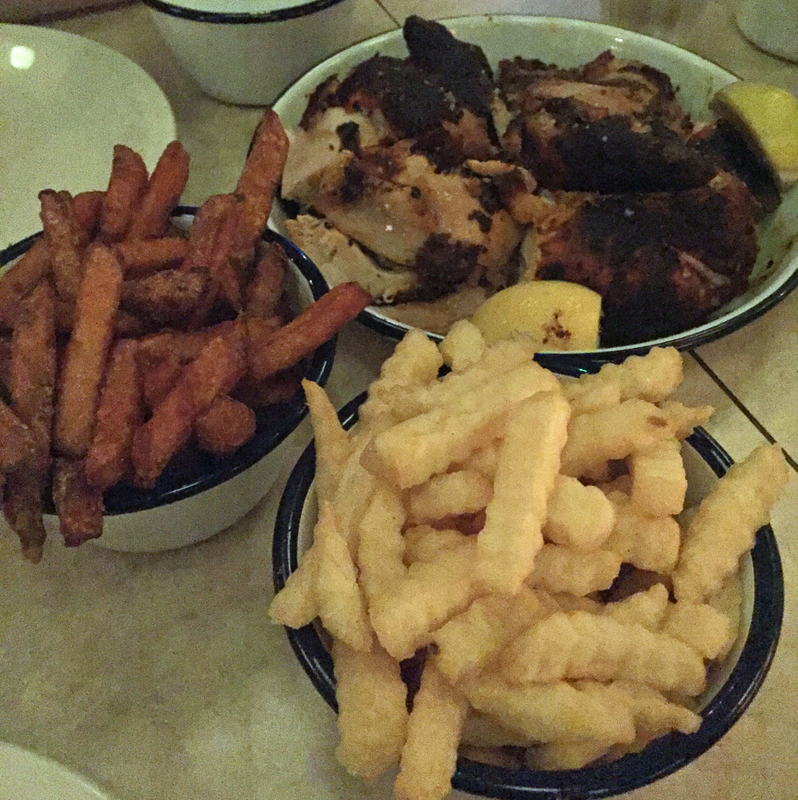 Having already sampled the Dirty Burger down Coldharbour Lane, see link here for our review, we decided to go for the Chicken Shop menu. You can, of course, order from both menus, so there doesn’t have to be a chicken v. burger debate. We went for a whole “marinated rotisserie chicken” with portions of sweet potato fries and crinkle cut fries to share between three of us. There’s a choice of Chicken Shop’s own Hot Sauce and/or Smokey Sauce to add extra flavour. The chicken itself got mixed reactions. Two of us loved it and were not too upset when the third found it not to their taste, describing it as “a bit odd, particularly the marinade”, since it meant more for us. All of it went anyway. Both sorts of fries found favour. Unfortunately we seem to have lost the bill but the total cost, most of which was for the reasonably priced cocktails, was OK for an enjoyable night out. This is obviously not a place for fine food but rather somewhere to meet up with friends and to socialise. It’s likely that we will be back, at least during it’s less busy moments.